Donna is Coming to Town! Friends! I have some very exciting news!!! I have the privilege of hosting one of the main artists I admire and have been learning from over the past few years! Yes! Donna Downey is coming to Hamilton, Ontario, Canada! (Stoney Creek, if you want to be precise). Just over 2 years ago I attended 2 workshops at Donna’s Studio in North Carolina…one with her and one with Jane Davenport. And I am telling you with no word of a lie, it was a life changing experience for me. With Donna’s Abstract Florals workshop, I learned how to see and translate shadow and light onto the canvas. I learned to paint freely and intuitively, appreciating the movement and flow of the brush strokes. I learned to paint emotion through colour. I left feeling alive, brave and free. I left with more confidence…both in my art and in myself. I felt inspired to create, and to share with other people, for I may be able to inspire others. Donna’s workshops are so much more than just art lessons. She enables you to dive deep into your intuition and encourages you to trust and express your truest self. She encourages you experimentation and play with colour, which evokes joy, excitement and peace. I believe anyone can benefit from a workshop with Donna Downey. She teaches in a way that a beginner can follow and be impressed and happy with the experience and outcome. At the same time, she pushes the experienced artist beyond the limits of their comfort zone, uncovering a new technique or way of seeing or transferring what is seen onto their work. Donna challenges your mind and teaches not only techniques, but ways of looking at your own work in a new light. She encourages you to embrace your own unique style, and follow your heart’s desire with colour and brush strokes, media and subject. To explore something intimidating, in a friendly, encouraging and non-competitive environment. Regardless of your experience and style, there are tips that everyone can benefit from, and at different moments in your life, a new aspect of her teaching will resonate with you. Donna is also very inspiring. She is self-taught, and takes a lot of pride in her experience. One of her online courses is an Artist Study, where she focuses on one famous artist from history every month, teaches and practices techniques and then interweaves them into her own style. It is a phenomenal course! 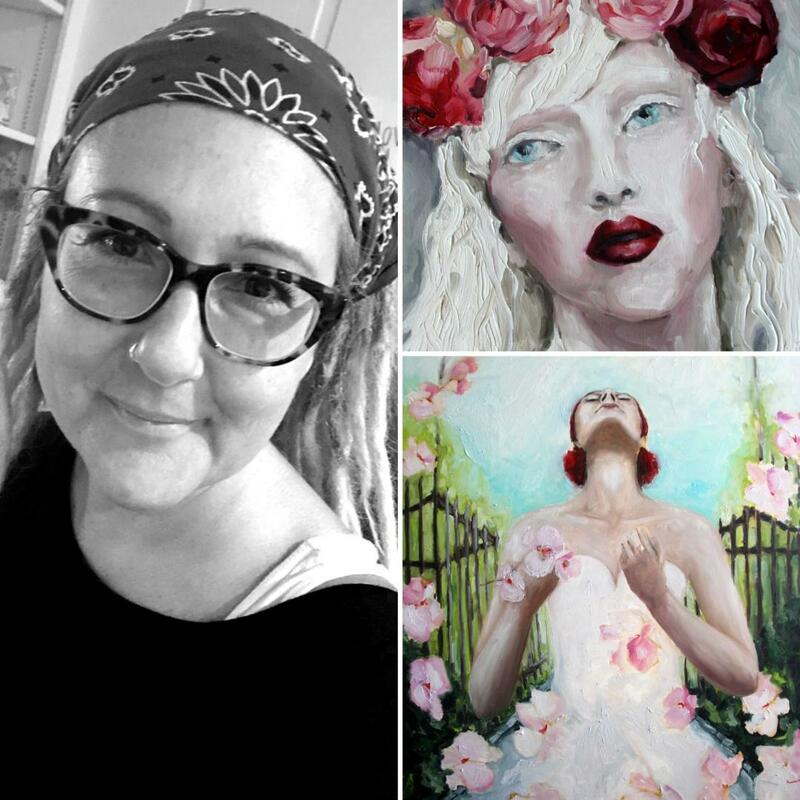 She dives fearlessly and passionately into new techniques, styles and art media, and is enthusiastic to share her talents and techniques with the world. Figurative and Flowers is the name of Donna Downey’s Traveling Studio Workshop. And it sounds so very exciting!!! Students bring their preferred supplies, either oil or acrylic paint. Wooden cradle boards primed with gesso and red acrylic paint are provided, as well as the use of an easel. On day 1, Donna will instruct the class in a guided lesson. You will paint together to develop your own painting based on Donna’s painting model. On day 2, you begin a fresh canvas with your very own inspiration! 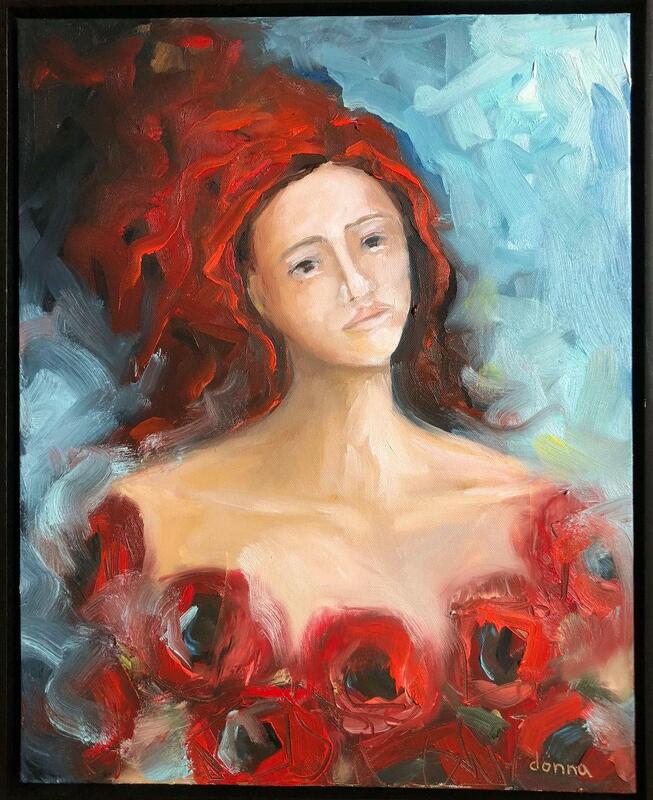 Donna will model techniques while you paint your own figurative composition of your choosing! She will be there for hands-on guidance and encouragement each of the two full days of the workshop. This course just screams excitement for me…the human figure AND flowers! Two very expressive subjects! And you get guidance for your very own original painting inspired by an image of your choice by Donna! Interested in more details? Click here. I wish I could be a student in this course. I would LOVE Donna’s feedback on my painting style, and to experiment with oils under her direction. However, I have the honour of hosting the event, and I am sure I will be busy helping and making sure everyone has what they need to be able to create freely. It amazes me how easily this came together. No, it didn’t happen over night, and yes it took up a lot of my attention and time, but it was totally worth it. I learned a lot. It is interesting to me how when you open yourself up to something, the opportunities needed to make it happen just appear. My original venue, Steel City Studio, couldn’t accommodate the large class size. But I joined a group online of Hamilton Makers as per their recommendation. That’s how I found the venue for this amazing workshop. Shabby Sunflower is a new storefront and workshop space opening up in Stoney Creek in September, 2018. They put out a post looking for people interested in teaching workshops in their beautiful space. So I reached out and we worked out the details. It really was that easy. I am so excited to see the studio in person next month! The renovation images look amazing! I am still working out some of the details, so if you have any questions, please, contact me by email (lizzieloumixedmedia@yahoo.com) and I will happily answer you or find the answer for you. Please share this blog with your friends and family. You never know who could use this amazing workshop and some face time with Donna Downey, as well as like-minded artists. Thank you!